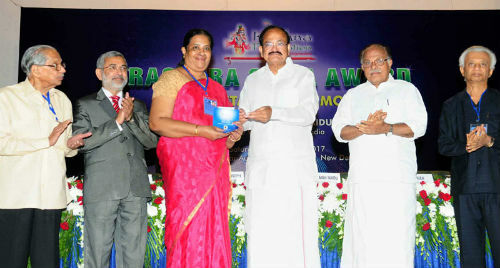 New Delhi: The Vice President of India, Shri M. Venkaiah Naidu has said that skill development is an important area in which NGOs and voluntary bodies must step up their activities to meet the growing requirement of vocational training and enable youth to find gainful employment or become entrepreneurs. He was addressing the gathering after giving away the ‘Rashtra Sewa Awards’ constituted by the Krishna Foundation, here today. The Deputy Chairman of Rajya Sabha, Dr. P.J. Kurien and other dignitaries were present on the occasion. 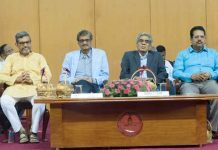 The Vice President said that Krishna Foundation has chosen poet and writer, Shri P. Parameswaran and Philanthropist and businessman, Shri Yusuff Ali for presenting Rashtra Sewa Awards in recognition of their services to the nation. The Foundation is also giving financial assistance to 20 school students belonging to weaker sections, he added. The Vice President said that even 70 years after Independence, the country is grappling with many social evils like poverty, corruption, illiteracy, terrorism, religious fundamentalism, atrocities on weaker sections and gender discrimination. He further said that while the governments are doing their best to overcome the challenges on various fronts, the efforts of NGOs and voluntary organizations will go a long way in supplementing the measures taken by the governments. The Vice President said that the NGOs all over the country that are working dedicatedly in different sectors – be it eradicating poverty, illiteracy, women’s empowerment, tackling the menace of child trafficking, drug and alcohol addiction or imparting skills to youngsters. He further said that for a country as large and as populous as India, more such dedicated organizations should step into the arena of social service. “The best way to find yourself is to lose yourself in the service of others”, said the Father of the Nation, Mahatma Gandhi, he added. The Vice President said that organizations like the Krishna Foundation can make a meaningful difference to the lives of the poor and downtrodden. About 65 per cent population below 35 years, the nation must fully take advantage of this huge demographic dividend, he added. “I am happy to be amidst you for the presentation of Rashtra Sewa Awards, instituted by Krishna Foundation. Conferring an award on an individual in recognition of the outstanding work rendered by that person in a chosen field or for social service is not only meant to serve as an inspiration for others but also to motivate the awardee to scale bigger heights. Indeed I am happy that Krishna Foundation has chosen poet and writer, P. Parameswaran and Philanthropist and businessman, Yusuff Ali for presenting Rashtra Sewa Awards in recognition of their services to the nation. I am told that the Foundation is also giving financial assistance to 20 school students belonging to weaker sections. Shri P. Parameswaran is a scholar, great thinker and above all a renowned social worker, who dedicated his life for society. He is a poet, writer and also a good orator. He left politics to take up social service and also served as the Director of the Deen Dayal Research Institute. He started Bharateeya Vichar Kendram in Kerala, aimed at national reconstruction through study and research. The Kendram regularly organizes debates and symposia on issues of larger national and social importance. The Kendram also has become a central place for intelligentsia to meet, exchange and nurture ideas. Shri Parameswaran is totally dedicated to the cause of the nation. He authored more than 30 books and was given Kerala Sahitya Academy Award for one of his books. Shri Yusuff Ali, Chairman and Managing Director of the Abu Dhabi-based Lulu Group International, is one of the well-known businessmen from India. He has provided employment to thousands of Indians and others and was awarded Padma Shri in 2008. Friends, even 70 years after Independence, the country is grappling with many social evils like poverty, corruption, illiteracy, terrorism, religious fundamentalism, atrocities on weaker sections and gender discrimination. While the governments are doing their bit to overcome the challenges on various fronts, the efforts of NGOs and voluntary organizations will go a long way in supplementing the measures taken by the governments. Social service in the complete sense of the terms should be the motto of such organizations. No doubt, there are numerous voluntary organizations/ NGOs all over the country that are working dedicatedly in different sectors– be it eradicating poverty, illiteracy, women’s empowerment, tackling the menace of child trafficking, drug and alcohol addiction or imparting skills to youngsters. However, for a country as large and as populous as India, more such dedicated organizations should step into the arena of social service. “The best way to find yourself is to lose yourself in the service of others”, said the Father of the Nation, Mahatma Gandhi. In another observation, he had stated: “To give pleasure to a single heart by a single act is better than a thousand heads bowing in prayer”. Organizations like the Krishna Foundation can make a meaningful difference to the lives of the poor and downtrodden. Today, our country’s greatest asset is its young population. With about 65 per cent population below 35 years, the nation must fully take advantage of this huge demographic dividend. Keeping this in view, the government launched a massive mission for skill development. This is an important area in which NGOs and voluntary bodies must step up their activities to meet the growing requirement of vocational training and enable youth to find gainful employment or become entrepreneurs. Similarly, adult literacy could be one of the focus areas. The talents and energies of the youth need to be channelized in a proper and constructive manner for their own well-being and of the society at large.